Origin and Production. The oil from the cones of Abies alba, Ger. Templinol is distilled in Switzerland, e. g. in the Emmental, and in several regions of the Oberland, also in the Thuringian forest. The one-year-old cones collected in August and September are subjected to steam distillation. In Switzerland5) the cones, picked in September, are smashed with a wooden mallet in order to free the seeds for the purpose of increasing the yield of oil, which is distilled from a common copper still with water. 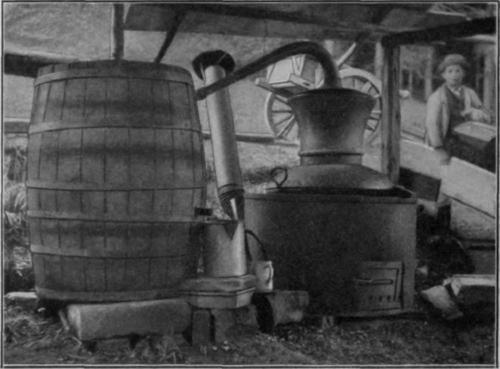 The still is heated directly by a wood fire. The condenser consists of a serpentine tube in a wooden tub. 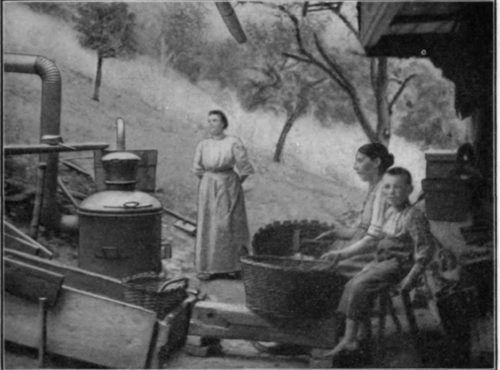 The distillate is collected in the old-fashioned Scheidglasern. These are a sort of glass separating funnel of 3 to 4 liters capacity with a large body. The opening in the bottom is closed by means of a stick fitted more tightly into the orifice by means of a piece of cloth. From time to time the stopper is raised to draw off the water in order to separate it from the oil floating on the surface. From a charge of 60 kg of cones about 400 g oil are obtained, however, the yield varies according to locality and climatic conditions. Unless care is taken to regulate the water supply, the addition of not enough water or by distilling too long, the oil acquires an inferior empyreumatic odor. 1) Arch, der Pharm. 231 (1893), 291. 2) Comp. also Hirschsohn, Pharm. Zeitschr. f. Russland 81 (1892), 593. 3) Report of Schimmel & Co. April 1904, 78. *) Bed. Berichte 40 (1907), 4919. 5) Ludy, Schweiz. Wochenschr. f. Chem. u. Pharm. 47 (1907), 818. Fig. 13. 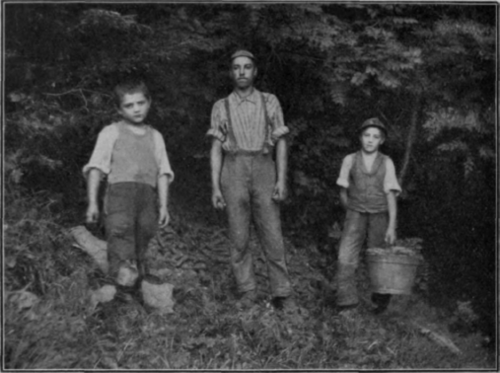 Collection of Cones: Picker (Brecher) and gatherers (Leser). Fig. 14. Larger distilling apparatus. Distillation of Edeltannenzapfen in Switzerland. Fig. 16. 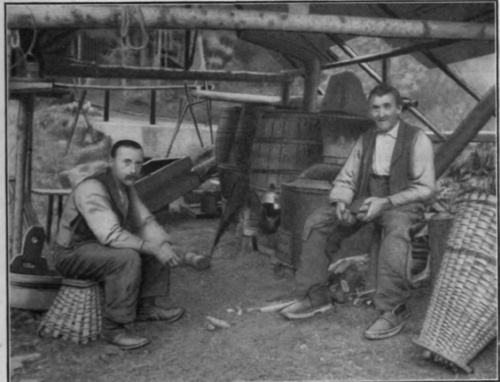 Interior of a distillery (Brennhutte). Properties. This oil is colorless with a pleasant balsamic odor reminding somewhat of lemons and oranges. Specific gravity 0,851 to 0,870; aD - 60 to - 84°. Thuringian oils occasionally have a lower optical rotation due possibly to the presence of the oil from the cones of Picea excelsa, Lk. The ester content, computed as bornyl acetate, varies from 0 to 6 p. c. With 5 to 8 vols, of 90 p. c. alcohol the oil yields a clear solution, rarely a turbid one. It is characterized by a high content of /-limonene. The higher the laevorotation and the lower the specific gravity, the richer the oil is in limonene. When distilled, 11 p. c. pass over between 150 and 170° and 37 p. c. between 170 and 185°. Above this temperature partial decomposition sets in with liberation of acetic acid. Composition. Of the older investigations of Templinol those of Fluckiger1) and Berthelot2) should be mentioned. These investigators studied the action of strong acids on the oil and obtained terpin hydrate, a terpene monochlorhydrate and a terpene dichlorhydrate. The formation of these substances is attributable to the presence of pinene and limonene found later. Later Wallach3) examined a Templinol that had been labeled Fichtennadelol and found pinene and limonene to be the principal constituents. Bertram and Walbaum4) showed that the pinene is also laevogyrate and that Templinol consists largely of /-a-pinene and /-limonene. In addition they found only small amounts of ester the nature of which was not sufficiently determined. Later Schimmel & Co.5) showed that borneol occurs as ester (presumably as bornyl acetate) in the oil (m. p. of the acid Seed Oil from Abies alba. 1 1 7 phthalic acid ester 164°). In addition there appear to be present another alcohol (b. p. 190 to 197°, d15o0,9013) and a sesquiterpene. 1) Vierteljahresschrift f. prakt. Pharm. 5 (1865), 1; Jahresber. d. Chem. 1855, 642. 2) Journ. de Pharm. et Chim. III. 29 (1856), 38; Chem. Zentralbl. 1856, 139. 3) Liebig's Annalen 227 (1885), 287. 4) Arch, der Pharm. 231 (1893), 293. 5) Report of Schimmel & Co. April 1909, 80. On account of its high /-limonene content, the Edeltannen-zapfenol is the best source for the production of this hydrocarbon.